Healthy eating is important from the day we are born. As a child, we grow quite rapidly and this is due in part to the foods we eat. Foods all contain nutrients that provide us not only with fuel to live our daily lives, but also with the very substances that build our bones, muscles, and organ tissues. Not getting enough of one nutrient or another can cause a variety of problems, including stunting our growth. For mothers who are nursing, nutrition is important because breast milk contains the nutrients a child needs to grow and develop properly. Upon growing older, these nutrients are then found in food, but don’t think that healthy eating isn’t important for growth after you’ve gone through puberty. Cells continuous break down and rebuild, so healthy eating for growth continues to be important until the day we die. Maintaining function is also not important without healthy eating. In out daily lives, we use energy to think, walk, talk, breathe, and perform any other action. The energy it takes our body to do these things comes from two places: fat reserves in the body or our daily food intake. If you don’t eat healthy foods, you will find that you are storing more fat that necessary or that you aren’t getting enough and you feel sluggish or weak. Along with energy-providing nutrients, like fats and carbohydrates, we also need the right nutrients to allow our organs to do their jobs. Hormones and other substances in the body make sure that everything is working properly. If you don’t eat the right nutrients, your body cannot produce these hormones and, as a result, cannot function properly. 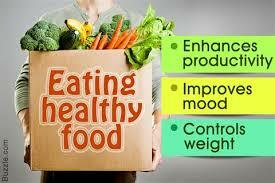 Lastly, healthy eating is important in order to prevent illness. When we do not get the right nutrients, or body’s natural defense system against diseases weakens, allowing viruses and bacteria to attack the body. It’s like a well-trained army—if the army doesn’t have enough to eat, it will not do well in battle. Without healthy foods and plenty of water, our bodies simply could not operate on a day-to-day basis. Learning how to eat healthy foods is therefore and important lesson, and one which we should begin learning as children. 0 Response to "The Importance of Healthy Eating"